What Is a Mass Gainer? What Are the Benefits of a Mass Gainer? Who Can Benefit from a Mass Gainer? How do I Take a Mass Gainer? Are There Any Side Effects of Mass Gainers? How Do I Pick a Good Mass Gainer? In order to help you find a good product we’ve researched & compared the best weight gain supplements on the market right now. Pro Gainer is loaded with 60g of protein, 85g carbohydrates and 24 vitamins and minerals. It is the perfect post-workout for those looking for mass, or as a simple weight gain powder to use between meals. This product provides everything your body needs to gain mass, and none of the unnecessary junk. 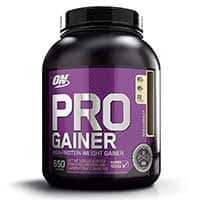 Who makes it: Pro Gainer is made by Optimum Nutrition, one of the biggest names in the sports nutrition industry. Since 1987, Optimum Nutrition, or ON for short, has been a leader in developing highly innovative, affordable, and effective products. In their 25+ years in the industry, ON has received many prestigious awards, and has developed a reputation for producing some of the most high-quality product lines available. ⓘ If you buy something using the links below, we get a small commission. Transparent Labs MASS GAINER uses only high quality ingredients, and provides full label transparency. It comes packed with 53 grams of 100% Grass-Fed New Zealand Whey Protein Concentrate (WPC80), 109 Grams of carbs sourced from organic tapioca maltodextrin, 6 Grams of Healthy Fats, and 3 grams Creatine Monohydrate. 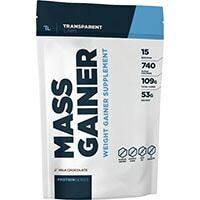 The use of premium ingredients does create the need for a price slightly higher than the market norm, but we’re confident that MASS GAINER may help you in your weight gain journey, for only a few dollars more. Who Makes It: MASS GAINER is made by Transparent Labs, the fastest growing new supplement company founded in 2015. Transparent Labs is known for their premium and effective workout supplements like PreSeries BULK, LEAN, STIM-FREE, BCAA Glutamine, and Creatine HMB – All pf which provide full clinical doses and 100% label transparency. 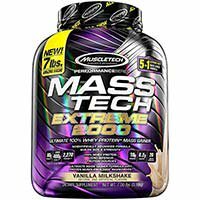 MASS-TECH is a mass gainer supplement from MuscleTech, a leader in the sports fitness industry. It’s designed specifically for “hardgainers” who struggle to put on muscle mass. It’s loaded with protein, carbs, BCAAs, creatine, and more, and provides an easy way to get a ton of nutrition in a single shake. It’s manufactured by a trustworthy, award-winning company, and its cost-per-serving is very reasonable. Who Makes It: MuscleTech is a large and popular manufacturer of sports science supplements. They have a long track record (20+ years) of success in developing award-winning products. In fact, they are the #1 most award-winning sports nutrition brand in the US! They also have several #1 best-selling individual products. All their offerings are made in the USA, in a cGMP certified facility. Overall, MuscleTech is a very trustworthy company when it comes to fitness supplements. 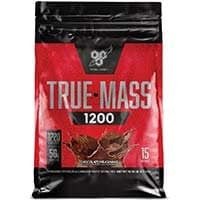 BSN True Mass 1200 offers 50g of high quality protein, 222g of carbohydrates and as its name suggests, over 1200 calories. It’s also one of the best-tasting – if you read user reviews, you’ll see that most people like the taste of this supplement. True Mass makes a simple, tasty shake that helps you reach your fitness goals by providing all the necessary nutrients for lean muscle mass gains. Who makes it: True Mass 1200 is made by BSN, one of the biggest and best companies in the supplement industry. For many years, BSN has been a pioneer of the industry, developing effective and innovative products for weightlifters and athletes alike. They have received many awards, and have millions of loyal customers. 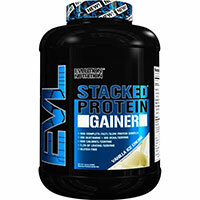 Stacked Protein GAINER by Evlution Nutrition packs a massive 50g of high-quality protein into just one serving, providing your muscles with all the fuel that they need to maintain and build lean mass. 10g of glutamine and glutamine peptides helps to avoid fatigue and accelerate recovery, even after the toughest of sessions. At 880 calories per serving, Stacked Protein GAINER by Evlution Nutrition is the perfect complete body fuel at any time of day or night. Who Makes It: Stacked Protein GAINER is made by Evlution Nutrition, a Florida-based company with a great reputation in the field of athletic nutritional supplements. Evlution Nutrition aims to bring you the most innovative, best quality, most effective supplements out there to help you to reach your fitness goals. 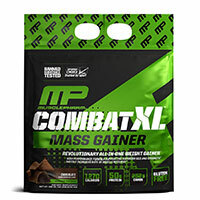 Combat XL Mass Gainer Protein by MusclePharm is an outstanding complete body fuel. This mammoth gainer packs in 1270 of dense calories into every serving, along with 50g of protein, 252g of carbohydrates and additional essential fatty acids – everything your body needs to build strength and gain lean mass. Another feature of Combat XL that makes it a cut above the rest are the high levels of calcium, iron, sodium and potassium that it provides – all essential minerals that can become depleted when following a high-intensity training program. Who Makes It: Combat XL Mass Gainer Protein is made by MusclePharma, a nutritional supplement manufacturer based in California. MusclePharma has been in the business since 2010 and aims to bring the safest, most effective sports and nutritional products, so that athletes of every level can benefit. 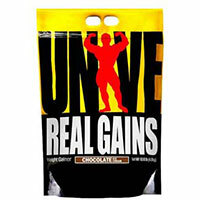 Real Gains, made by Universal Nutrition, is designed for active people looking to pack on the most mass possible. It has just about everything you need to build the body of your dreams – just add exercise, proper nutrition and dedication! Who makes it: Real Gains is made by Universal Nutrition, a company which has become a household name in the fitness community. For many years, Universal Nutrition has helped set the standard for quality in an ever-changing industry. Today, they manufacture a large line of highly effective supplements to suit the needs of a wide range of customers. 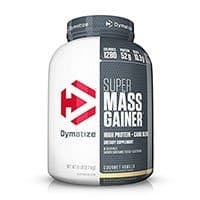 Super Mass Gainer is a weight gainer supplement made by Dymatize Nutrition that combines high quality protein with added amino acids, creatine, carbohydrates, glutamine, and more. Its complex carbohydrate blend can help give you sustained energy for your day and it’s high calorie content can help you gain weight. Who makes it: Super Mass Gainer is made by Dymatize Nutrition, a large scale producer of fitness supplements. Since 1994, Dymatize has strived to develop cutting-edge products that help their customers reach – and exceed – their fitness goals. Mass JYM is a unique mass gainer that has excellent reviews. It provides a balanced dietary profile, with less carbohydrates than average, and more fat. One big benefit of this product is that it does not use proprietary blends, so you can see each specific ingredient that’s included and the specific amount of that ingredient. It also uses a great mix of each macronutrient, offering 3 types of protein, 2 types of carbs, and a broad selection of beneficial fats. Instead of loading you up on cheap carbohydrates (sugars), it uses fewer carbs and more protein and fat. This results in a lower calorie count, but a potentially superior nutrient profile. The company claims that using a 1:1 ratio of protein and carbs is ideal for healthy muscle mass gains. 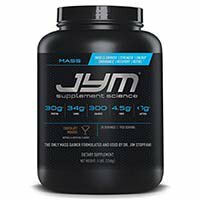 Who Makes It: This product is made by JYM Supplement Science, which was founded by Jim Stoppani. JYM Supplement Science won Bodybuilding.com’s Brand of the Year award in 2018 and has received a number of other prestigious awards in the supplement industry. They have gained the trust of their customers by always disclosing the full ingredient profile and amounts, rather than using proprietary blends. 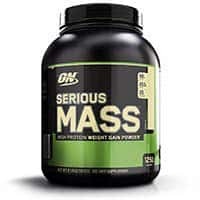 Serious Mass is made by Optimum Nutrition and provides a huge dose of calories, protein, carbohydrates and more to help you reach your weight gain goals. It’s a good choice, although the large serving size and higher-than-usual price is a downside. Who makes it: Serious Mass is made by Optimum Nutrition, one of the most popular supplement companies out there. Best known for their Gold Standard line of products, Optimum Nutrition has been an industry leader since they formed in 1987. Today, you can’t go far in a gym or supplement store without seeing an ON product, and the company has received many awards and much recognition for their high quality products. 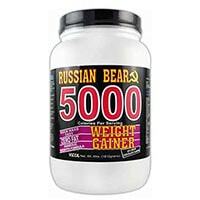 Vitol Russian Bear 5000 is a HUGE weight gain supplement. Its huge serving size is a downside for some people, but for those looking for the most calories and protein possible, this is best high-calorie weight gainer for you. That being said, the huge serving size is a little over the top. Many people use this product and take a ½ serving or even a ¼ serving, which is probably the best way to use it unless you’re on a very aggressive bulking cycle. Who makes it: Russian Bear 5000 is made by Vitol, a manufacturer of natural supplements and bodybuilding products. In business for more than 37 years, Vitol has come out with a lot of good products and has many loyal fans. When you first think of the term “weight gain”, certain foods are likely to come to mind: donuts, chips, cake, ice cream, cheeseburgers… the list goes on. But these foods are what experts call empty calories (1). Eating these foods can help you gain weight – but it will be 99% fat. Odds are, if you’re reading this, you’re not interested in gaining fat – you’re interested in gaining muscle mass! This is where weight gainer supplements, or sometimes referred to as “mass gainers”, can come in handy. These supplements pack a huge amount of protein, carbohydrates, calories, vitamins and other nutrients into a convenient, easy package. They are beneficial when you’re trying to gain mass, and are very useful for a variety of athletes, weightlifters and everyday people. If you’ve been working out hard but not seeing the right results, and you’re wondering how to gain muscle mass faster, adding a mass gain supplement to your diet might just be the key to your success. Generally, they come in powder form, so you can just mix them into water, milk, or throw them in a shake. Now, keep in mind that weight gainers are meant to be used in conjunction with heavy training. If you take one of these products, you will gain weight – but it will just be fat if you don’t exercise. If you train regularly, adding a mass gainer to your supplement routine will definitely help you pack on extra muscle – but don’t expect results without hard work, too! Weight Gain: Okay, this one’s obvious – but it’s the primary use of these products. Weight gainers are designed to supply a large quantity of both macro and micronutrients, in a convenient way. While many are striving for weight loss, others have goals to put on weight. And in some cases, this is more difficult than you might think!. Muscle Gain: Building muscle is hard work. It requires serious effort the gym, and also a solid nutritional intake. Adequate protein intake is essential for mass gain, with a recent meta-analysis study showing that consuming up to .73g of protein per pound of bodyweight was ideal for mass gain (2). That translates to roughly 130g of protein for a 180lb person – which can be difficult to obtain through whole foods alone. While protein is always thought of as “the muscle nutrient”, carbohydrates are also essential because of their role in glycogen production and storage (3). Mass gainers provide a huge amount of both protein and carbohydrates, which can potentially help with muscle growth (when combined with strength training). Weight Management: Some people use mass gainers not to gain weight per se, but to maintain their current weight. People like endurance athletes, who can sometimes have huge daily caloric needs, can benefit from the convenience of these supplements. Did you know Michael Phelps, Olympic swimming legend, had to consume 12,000 calories during his peak (4)? Recovery: Some weight gainers are beneficial to use after a hard workout. The high carbohydrate content helps to restore glycogen levels, while the protein content helps to spur recovery and muscle growth (4, 5). L-glutamine, another common addition in weight gainers, may also help with post-workout recovery and soreness (6). Weight gainers are useful for some people, when used in combination with a healthy diet and regular exercise routine. With that said, they can also lead to fat gain and other negative effects if used improperly. Weightlifters/Bodybuilders – Weightlifters who are looking to pack on muscle mass and make serious gains can greatly benefit from adding mass building supplements to their diets. Weight gainers will contain high doses of protein, carbohydrates, amino acids, and just about everything else needed for mass gains. Especially during “bulking” phases, these supplements are great. When you’re tasked with consuming 3,000+ calories and 100+ grams of protein per day, it’s very helpful to have a single product that can meet a good chunk of those requirements in one easy package. People with Fast Metabolisms – If you have a fast metabolism, you may find it difficult to gain weight or even maintain your own weight. If you struggle to gain weight, or if you’ve been working hard at the gym but just can’t seem to pack on the muscle you want, consider adding a mass builder supplement. These products provide a convenient, simple way to greatly increase your daily calorie intake, without having to eat food constantly all day long. Athletes – Most sports require you to be at least somewhat muscular. Many athletes can benefit from the high protein amounts in mass gainers. Not only that, but the amount of calories that mass gainers contain can provide a good amount of energy to get you through the game. For example, the guys at the rugby clothing brand – Rugby Warfare say that mass gainers are one of the most popular supplements that rugby players use because of their high protein and calorie content. Men and Women – Both men and women can benefit from weight gain supplements. The most effective weight gainers will provide a good boost in calories, without going over the top. Generally, men need more calories than women, so a lot of women will be able to gain weight without the help of supplements, but some women still need that extra boost (7). People who supplement protein can gain more muscle mass (8). For most people, these supplements are simply a way to add more calories and nutrients to your daily diet. They can be taken at pretty much any point throughout the day, as a simple way to increase your food intake. Now, keep in mind that there are different types of these supplements out there. As always, you should follow the directions on the product packaging of the supplement you’re using. Do not exceed the recommended dose, unless otherwise advised by a medical professional. Since you’ll get a lot of calories and nutrients from your regular meals, you should add supplements in between meals. That way, you’ll be able to increase your consumption without feeling overly full or bloated, and you’ll have a steady stream of calories to provide energy for your day. Also, mass gainers are great to take immediately following your workout. After intense exercise, your body craves protein and carbohydrates. If you don’t give it what it craves, your body can enter a catabolic state, which can negate your efforts at the gym and leave you feeling lethargic, sore, and tired (9). To avoid catabolism, you should consume a protein shake or mass-builder supplement immediately after working out. For convenience, many people like to use a BlenderBottle to keep a shake with them when they go to the gym. These handy little devices contain a shaker ball that helps keep your shake mixed up and ready to drink. Many people also take a mass gainer before bed, to help keep their body fed with protein. This may be useful for some, but keep in mind that due to the high level of calories in some of these products, taking a dose before bed might result in some fat gain. To prevent catabolism at night, a standard protein powder is usually a better option. Before taking any supplements, make sure you read the instructions that the manufacturer has placed on the label. This is a very important step. As with any supplement, you should know about any potential side effects before you begin taking a product. When it comes to weight gainers, side effects are generally mild. Some include: allergic reactions to ingredients, excessive weight and fat gain and potential harm to liver due to high amounts of ingredients and protein. One common issue is fat gain. Because these products are loaded with calories, they can lead to gains of unhealthy weight if you don’t exercise enough while using them. These supplements are designed to help you gain weight and muscle – but if you don’t train enough, you’ll just gain fat. Getting too many calories from ANY source will lead to fat gain. In order to benefit from taking a weight gainer, you need to be training hard and burning calories. In other words, don’t expect to see muscle gains without hard work, no matter what supplements you take! As always, we recommend you speak with your doctor before taking any supplements featured on this site. There are a ton of options out there when it comes to choosing the right mass building supplement. Let’s take a look at some of the factors you should consider when choosing a supplement. Ingredients – take a close look at the ingredients in any products you’re considering. What’s in it, and how much? How many calories per serving, how much protein, how many carbohydrates? Keep in mind how you can benefit from the included ingredients, and how the product will stack with other supplements you may be taking. Brand reputation – is the manufacturer well-known and trustworthy? Do they have a good reputation for making quality products? All the products on this list below are made by reputable companies, but if you’re looking elsewhere be sure to do your research before buying anything. Value for money – you’ll want to consider the price per serving of your various options. Always calculate the cost based on individual servings, instead of just the cost of the overall package. Also, keep in mind that cheap weight gainers will likely not be as high quality as the more expensive ones, so you’re not necessarily looking for the lowest priced product. Can you make it yourself – Mass gainers are pretty simple products that you can make yourself in a blender using simple ingredients. Check out our high calorie weight gainer shake recipe.